When logging in to a website by entering a user name and password credentials in Google Chrome, the web browser will prompt for options on whether users want Google Chrome to save the password. Options that available are either save password, or never for this site. If the user click on “Never for this site” button, intentionally or accidentally, Google Chrome will not prompt and ask users whether to save the password for automatic future login anymore. In Google Chrome, click on Wrench (Customize and control Google Chrome) icon. Go to Personal Stuff tab. Click on Show saved passwords button under “Passwords” section. 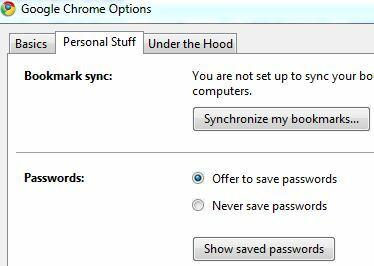 Select to high the sites in which you want Chrome to prompt to save password again, and click on Remove button. Alternatively, click on Remove All button to reset and clear the whole exceptions list so that all websites will be opened for chance to have password remembered by Chrome again.